Hey Loves, Today I’m bringing you a a great date night spot, it’s also a good place for dinner with a couple of your friends. The setting is very intimate, so I don’t recommend coming here with a big group. 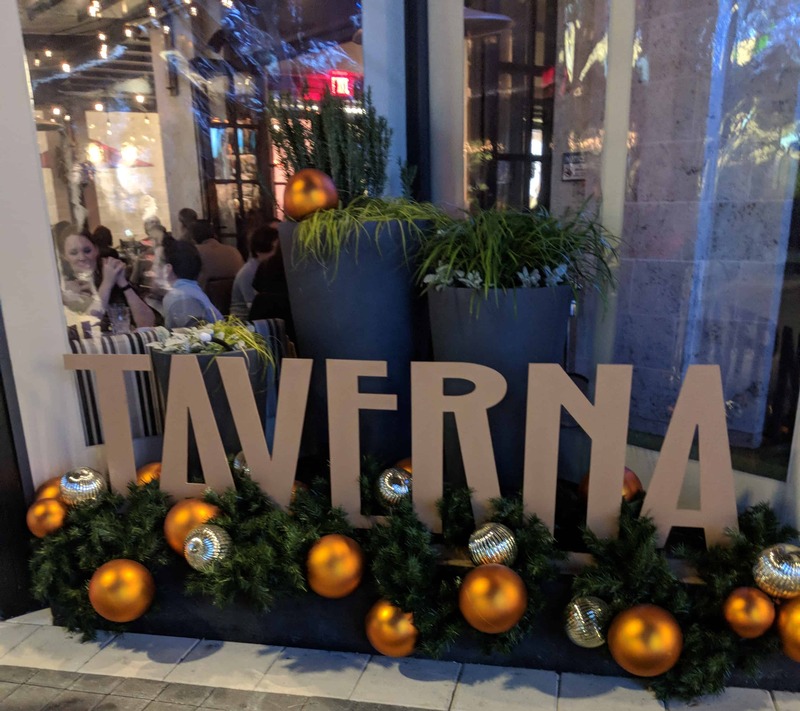 When I found out a Taverna was opening in Legacy West, I couldn’t be more thrilled that I no longer had to get on the Tollway to enjoy a great Italian meal. Even if you’ve visited the Dallas locations, you should still check out the one in Plano. 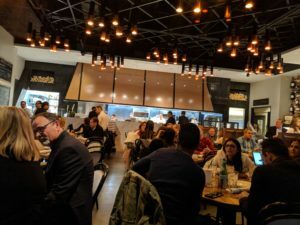 This location is a bit different because it has a rotisserie that changes the featured cuts of meats often. This menu is also not as pasta focused, as the Dallas location. While it is definitely Italian, it lends itself more to Mediterranean flavors. On the night the Hubs and I went, our waiter Garrett, was awesome and he offered great recommendations for both food and wine. He convinced me to step out of my go to Pinot Noir box, and instead I tried some delightful Italian wines. I had the Ripasso, an Italian red. When the weather is cold, I have to go with red. The Hubs went for the Antanori, an Italian Chardonnay. The Hubs and I decided to go for all seafood everything. 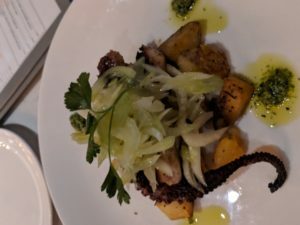 We stared off with the charred Spanish octopus, which was full of flavor and perfectly charred. 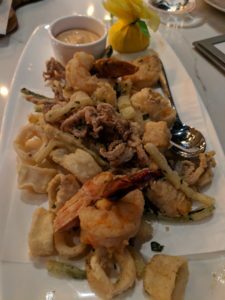 If you are not a fan of octopus and want something more traditional, try the frittura misa di mare (say that 3 times fast). It is an assortment of fried seafood. 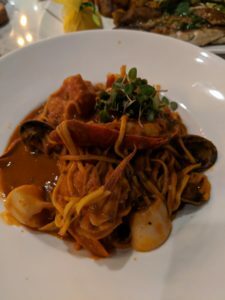 For our entrees, we had the Tagliolini Al Futti Di Mare. This isn’t your average seafood pasta. It has a light tomato based sauce with clams, scallops, and shrimp. 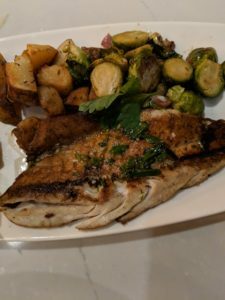 I had the grilled Branzio, a flaky white fish. 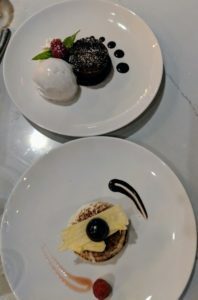 Both dishes were delicious. Garret insisted that we save room for dessert. The Hubs is a chocoholic, so if there is a chocolate dessert on the menu, he’s all over it. 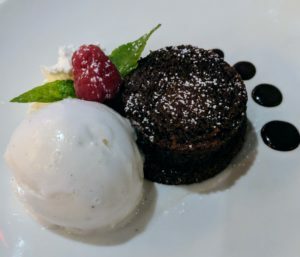 He went for the chocolate hazelnut cake with homemade vanilla gelato (which is literally made in house). The cake was moist yet dense and chocolaty. But can we have a moment of silence for this gelato! I could eat a big ol’ bowl of just the gelato. 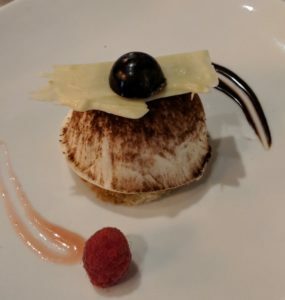 I decided to get the Tiramisu, which was slightly different than your traditional tiramisu. Can you believe it was better. There is none of that layering because the marscapan is the star here. There are ladyfingers at the bottom and then a creamy texture of goodness with a dust of coco powder at the top. 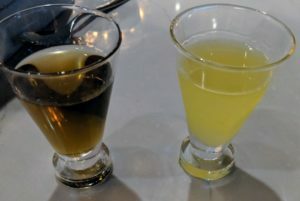 We also had some after dinner drinks to close out a great meal. 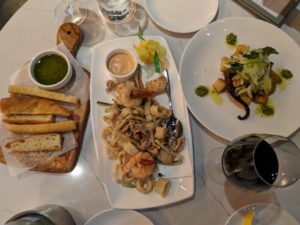 If you haven’t already, put Taverna in your date night rotation!